A Companion to the History of the English Language addresses the linguistic, cultural, social, and literary approaches to language study. The first text to offer a complete survey of the field, this volume provides the most up-to-date insights of leading international scholars. 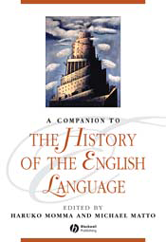 An accessible reference to the history of the English language. Comprises essays written by leading international scholars. Aids literature students in incorporating language study into their work. Includes an historical survey of the English language, from its Germanic and Indo-European beginnings to modern British and American English.